For foreign enterprises operating in Asia, terminating an employee is a process fraught with various dos and don’ts. Employers may encounter regulations that seem to offer an overly high degree of protection to the employee’s job security, or anachronistic legislation that hasn’t kept pace with the given country’s current environment. The procedure for terminating an employer differs markedly across Asia. Previous ASEAN Briefing and Vietnam Briefing articles illustrate how diverse the process can be within the Association of Southeast Asian Nations, with each country in the ten-nation bloc having their own distinct set of laws. Failure to identify and adhere to the relevant regulations can result in unfair dismissal suits and prove costly for the perpetrating company. Foreign enterprises operating in Asia need to be fully versed in the relevant government framework to avoid unnecessary disputes. In this article, we present a case study from China Briefing that illustrates how a successful termination can be made in China – a country with a unique regulatory framework connected to human resources. Hiring competent and qualified staff is an integral step in the establishment of any company, and this is particularly true for foreign enterprises. For companies planning to operate within China, employing Chinese nationals can be particularly useful in overcoming linguistic, legal, and cultural barriers. 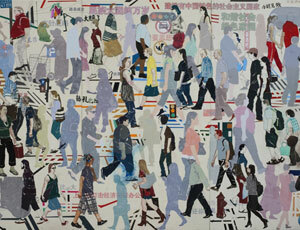 Competition for Chinese labor has heightened since the implementation of China’s One Child Policy in 1978. China’s aging population has not been complemented by an equally large rising working class, and this trend has created a shortage of available Chinese workers in the recent years. According to Stephen Orlins, the President of National Committee on US-China relations, China’s 18 to 30 age demographic has reached its peak, and with the decreasing birthrate, China’s supply of workers will continue to dwindle. Known as one of Asia’s more stable and well-developed countries, Singapore has increasingly become an attractive business environment for many prudent foreigner business professionals and investors. A contributing factor to Singapore’s success is the government’s strong incentives program for foreign talent to commit to the country. One such incentive is the permanent residency (PR) scheme, with basic perks including the freedom to enter and exit the country, the right to purchase real estate, employer contribution to Singapore’s social security network (Central Provident Fund or CPF), and a certain degree of job security. With these incentives in place, the government hopes to continue to draw in talented professionals who can strongly contribute to the country, both economically and culturally. Apart from placing full time expatriate employees in China, as an investor you may often need to send staff from the parent company to China to complete temporary projects. Common examples include quality control, engineering projects, training or consultancy. However, what many foreign investors don’t know is that such visits may result in the parent company being subject to a wide array of Chinese taxes. This may even be the case if the company already has a subsidiary in China. So how does this work? Obviously, a foreign-owned company incorporated in China is subject to Chinese tax. However, if a company registered abroad is deemed to have ‘permanent establishment’ in China, it will be subject to Chinese tax as well, such as Corporate Income Tax, VAT and other local surcharges. This would happen if the foreign enterprise has a business venue or construction site in China, is represented in China by an agent, or – most relevant to the topic at hand – dispatches personnel to China to provide services. This includes services rendered to the local subsidiary. Foreign companies expanding their operations into the Asia-Pacific need to be fully versed in the region’s various hiring policies. While firms are permitted to hire both domestic and overseas employees, businesses will need to understand a unique array of considerations and challenges that do not exist in the West. Within Asia, the laws that govern hiring procedures vary significantly from country to country, with numerous affiliated conditions and stipulations. Companies looking to establish a presence in more than one of the region’s booming economies will not be able to do so under a single policy, as may be possible in other parts of the world. 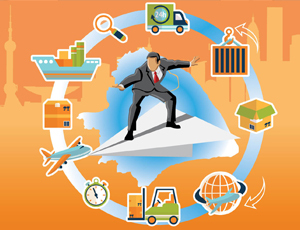 Rather, the procedures of each country will need to be individually interpreted, which will better prepare a company to decide which Asian jurisdiction best suits their operation. Generally speaking, Indian employment contracts are less sensitive than those of China and Vietnam and can offer greater flexibility to the employer. Chinese and Vietnamese employment law tends to provide more protection to the employee and can force employers into unwanted contractual obligations if proper due diligence isn’t paid. Foreign enterprises in Asia generally opt to hire employees on a fixed-term basis in order to mitigate liability for unjust dismissal. In this section, we detail how these types of contracts are structured in China, India and Vietnam, outline the other main types of employment contracts available to employers, and provide practical guidance for maintaining compliance before and during an employment relationship. 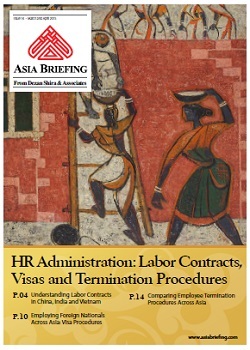 The newest issue of Asia Briefing magazine, titled “Human Resources Across Asia: A Guide for Foreign Businesses“, is out now and available as a complimentary download in the Asia Briefing Bookstore. The 10 member countries of the Association of Southeast Asian Nations (ASEAN) are continuing to grow. Whilst the organization’s five biggest economies of Indonesia, Malaysia, the Philippines, Singapore and Thailand – collectively known as the ASEAN 5 – have traditionally led the way for attracting foreign direct investment (FDI), the 10-nation bloc’s remaining members are beginning to catch up. One of the principal advantages that countries outside the ASEAN 5 possess is their comparatively lower minimum wages, which translates to lower production costs for companies operating there. This advantage has often been promoted by each of the five’s respective governments, but developments in the past year suggest that wages across these nations will soon change. Industry protests for higher minimum wages have become commonplace, and the governments of several countries have announced salary hikes. SHANGHAI – Myanmar, the Philippines and Indonesia are three attractive emerging destinations for foreign investment and business in Asia. With a combination of abundant natural resources and cheap manufacturing and labor, industries in these countries are projected to become some of the fastest growing in the world. Continuing Asia Briefing’s series of visa guides, this article will focus on what you can expect when seeking to obtain a visa from these three Southeast Asian countries. SHANGHAI – Salaries across the Asia-Pacific are due to increase on average by seven percent next year, according to a Salary Budget Planning Report released yesterday. The predictions, conducted by professional services firm Towers Watson, have provided a projected overall salary increase for twenty key nations in the region. The report states that Pakistan, Bangladesh and Vietnam will see the steepest hikes, each at over 11 percent, whilst India follows close behind with an increase of 10.8 percent. However, the report also emphasizes that due to a rise in inflation in Asia, salary increases in ‘real terms’ will be entirely different. Once inflation is taken into account, it shows that China will lead the way in wage increases in 2015, with a rise of 5.2 percent. Pakistan (4.5 percent), Bangladesh (4.3 percent), Vietnam (4.1 percent) and Sri Lanka (3.8 percent) then make up the four other nations in the top five of salary raises in 2015, with India ranking sixth with a corresponding real increase of 3.5 percent.